Koopa's Seaside Soiree (known as Koopa's Seaside Soirée in Europe and Oceania) is an island resort board hosted by Koopa in Mario Party 4. He built it because he always wanted to have a place to hang out by the sea and wanted his friends to have fun in it. Here, Koopas are everywhere and are in charge of the games and shops (the one hosting wears a light blue Hawaiian shirt). The main attractions here are the dolphins and the Koopa Kabana hotel. Players that land on a Happening Space next to a dock (with a picture of a fruit on it) summon a Dolphin that takes them to another dock with the corresponding picture. The player cannot refuse to ride the dolphin. One of the Koopas constantly tries to get coins from the players so that he can build the resort hotel, the Koopa Kabana. Every time players pass the Koopa space, they pay five coins. The more coins invested, the more sophisticated the Kabana appears. If players land on one of the ? Spaces in front of it, the Koopa asks that they pay the fine for a one week stay at the Kabana, which is the amount of coins that is currently invested. When the fee is paid, a tidal wave comes in and destroys the Kabana, so the investments start all over again to build another one. Another feature of the board is the two Ukiki's Banana Peel Junctions on the left and right edges of the board. When they are approached, the Ukiki at the junction will throw a banana peel down, which the player then slips on. This causes them to advance in a random direction, up or down. If the player is wearing a Bowser Suit, they will be able to choose a direction manually, because, as the game states, "Bowser doesn't slip on banana peels". 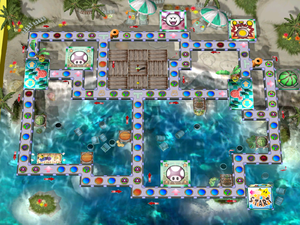 The Item Minigame of the board involves hitting one of three melons that have an item in each. Players are spun around before they choose, making it harder to make a choice. The Coin Minigame involves fishing. Players are given one of the fishing rods. The chosen rod is used to reel in the fish that gets caught on it. The bigger the fish, the more coins players win. In Story Mode, if the player beats the opponents on the board, Koopa Troopa challenges the player to a minigame called Kareening Koopas in order to win his present. French Soirée Koopa Cabana Copacabana parody name. The Koopa Kabana is a pun on Copacabana, a beach in the Brazilian city of Rio de Janeiro that also appeared in Mario is Missing!. This page was last edited on March 2, 2019, at 19:25.